Claudy Jongstra (b. 1963, the Netherlands) is a textile artist whose holistic practice is intertwined with the natural cycle of her native landscape. A graduate of Utrecht College of Art, Jongstra has worked to master the ancient craft of making wool felt, humankind’s earliest textile, since 1994. She is equally regarded for her large-scale artworks and architectural installations as for her deep-seated commitment to the environment. Carefully considering the evolution of color and material from source to site, Jongstra is immersed in all aspects of her work: maintaining a flock of rare, indigenous Drenthe Heath sheep and growing botanical dyestuffs on a small-scale biodynamic farm in the northern Netherlands. Claudy Jongstra is included in the permanent collections of the Cooper Hewitt, Smithsonian Design Museum; the Los Angeles County Museum of Art; the Museum of Modern Art; the RISD Museum; the Stedelijk Museum; and the Victoria & Albert Museum, among others. Collaborators include Rem Koolhaas; Steven Holl; Tod Williams & Billie Tsien; Snøhetta; Gensler; Bohlin Cywinski Jackson; Donna Karan; Christian Lacroix; and John Galliano. The study of materials is also the study of history, ecology, architecture, economics, agriculture, politics, and reaches every corner of daily life. In our studio, research and experimentation with botany, natural fibers, and organic pigments have fostered a deep intellectual and instinctive connection to materials. In the contemporary context of global ecological degradation, we must understand material as a single state in a larger chain of creation, from sheep to yarn and seed to pigment. If we spread this understanding, we can begin to shift our relationship with this chain of creation, and thus with the earth itself. Over the past 20 years, Dutch artist Claudy Jongstra has built an artistic practice intertwined with the natural cycles of her local environment of rural Friesland, in the Northern Netherlands. Native Drenthe Heath sheep and a biodynamic dye garden provide both the physical and inspirational foundation for each of her monumental hand-felted artworks and architectural installations. At the very core of her practice is her flock of indigenous Drenthe Heath sheep. Europe’s oldest breed of sheep, Drenthe Heath are raised primarily for vegetation management, not meat production. With the introduction of chemical fertilizers to their native heathlands of Drenthe in the Netherlands, the breed faced obsolescence and the threat of extinction. The price of their wool was too low to provide any economic incentive to keep them. In 1948, a heard was found in the Dutch village of Ruinen and efforts began to save the breed. Today, there are only 1200 Drenthe Heath sheep in the world. Our sheep not only provide their wool for our textiles but also contribute to the ecological preservation of the Dutch moorlands. In 2008, Studio Claudy Jongstra was awarded the Prins Bernhard Cultuurfonds Award for Applied Arts and Architecture. With the funds, the Studio built a highly specialized biodynamic botanical dye garden on a plot of land outside the dye workshop to facilitate direct contact between the dyers and the plants. In 2010, Claudy began to expand her backyard garden to production scale with Northern Colors, an initiative to spread biodiversity across the Northern Netherlands. A vast majority of farmers in this region currently operate on an economic model based on monoculture. Potatoes, grass, and corn dominate the landscape. 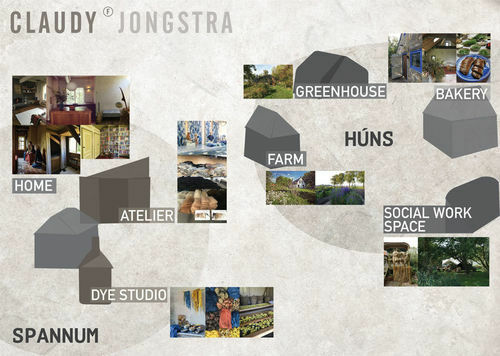 Through our initiative, seven local farmers have dedicated a portion of their land to grow organic natural dye plants for Studio Claudy Jongstra. By providing an economic incentive for the growth of historical natural dye plants including woad (European indigo), madder, and dyer’s chamomile, Northern Colors extends the legacy of these plants into the contemporary landscape. Claudy Jongstra’s artworks of naturally-dyed fibers render visible these hidden colors, expanding awareness of their existence. The greater this awareness becomes, the more economic value the dye plants generate, thus increasingly incentivizing biodiversity through the revelation of color. In 2014, Claudy Jongstra and her partner Claudia Busson purchased De Kreake, a plot of formerly abandoned farmland in the small village of Húns. To break ground, Friesian draft horses pulled plows across the earth. Rye, a natural fertilizer, was the first crop planted and inspired the conversion of an old barn into a brick-oven bread bakery. The farm and bakery host Farm of the World, an agricultural and social initiative that focuses on exploring new and sustainable futures for the Dutch countryside through small-scale biodynamic farming and social programming. An education program for underprivileged local youth provides opportunities to work in the vegetable garden, prepare meals and bake bread together, and express creativity in art workshops. Collaborative projects with local and international communities at De Kreake revitalize the land with a rich productivity, from food to bouquets to ceramics to social space. The new publication 'Claudy Jongstra' was published in 2017 by nai/010, Rotterdam in a radical design by renowned book artist Irma Boom. The book focuses on the working process of preparing the natural fibers, coloring with plant pigments, and creating the works by carefully composing through felting, weaving and embroidery. This unique working process is reflected in the specially developed ink colors based on natural ingredients ICMI (indigo, chamomile, madder, darker indigo) and likewise not hiding phases of the process, as in the uncut folded pages. The ‘Claudy Jongstra’ U.S. Book Launch was hosted by the Cooper Hewitt Smithsonian Design Museum in New York City on May 31, 2018. Studio Claudy Jongstra presents WOVEN SKIN, an artwork and a nomadic forum for vital international dialogue on issues of biodiversity and dissemination of knowledge, particularly in relation to art-making and agricultural practices. AN ARTWORK: Claudy Jongstra’s monumental tapestries come off the wall for the first time to take shape as a sculptural textile installation. Sixty unique modular textile works compose the final construction inspired by the protective layers of a seed pod. Earthbound and human in scale, completely sustainable and empathetic, biodiversity is legible on the brilliantly-colored surfaces of the WOVEN SKIN. A NOMADIC FORUM: On a carefully curated international tour, WOVEN SKIN will examine three core themes - ecology, color, community – through workshops, lectures, and collaborations with local communities, artists, artisans, designers, activists, scientists and architects. As the sculpture travels, the WOVEN SKIN community will expand in breadth and depth, generating a diverse, powerful movement. Fibers naturally dyed with slow-dried, organic pigments from Studio Claudy Jongstra’s botanical collection garden, and hand-felted through a combination of water and friction to create a single textile. Steel armature designed and built in collaboration with local Dutch metalworkers. Gieskes-Strijbis Fonds, Maharam (Herman Miller INC.), Museum de Lakenhal, University of Utrecht, Leeuwarden European Cultural Capital 2018, Triodos Bank N.V.